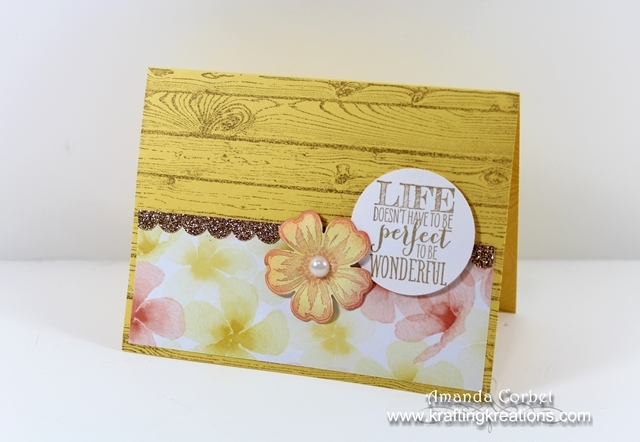 Here is another card from the January Make and Take! It's also one of my favorites from January! So much texture and pattern! Daffodil Delight card stock 5-1/2" x 8-1/2", scored at 4-1/4"
Watercolor Wonder DSP 2" x 5-1/4"
Champagne Glimmer Paper 5/8" x 5-1/4"
Now for the flower. First we are going to do a little bit of water coloring. Grab a scrap of Whisper White card stock. 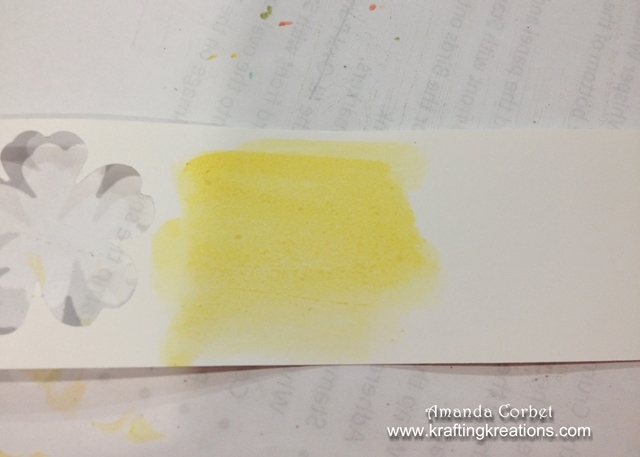 Squeeze the center of your closed Daffodil Delight ink pad, then open it half way. See the ink that is on the lid? We are going to use an Aqua Painter to pick up some of that ink and color it onto the scrap of Whisper White card stock. It doesn't need to be perfect and it just needs to be about big enough for your flower image. Now dry the ink with the Heat Tool. You want it completely dry before you stamp your flower. 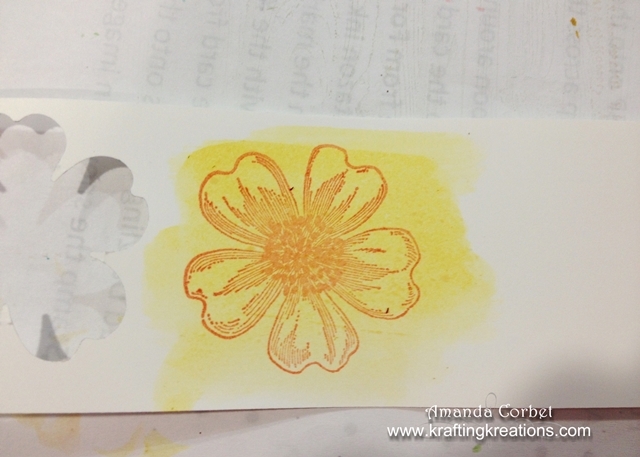 Take the flower image from Flower Shoppe and stamp it on top of your yellow splotch in Crisp Cantaloupe ink. Now punch out the flower image with the Pansy Punch. To add shape to the petals of the flower curl them around your finger, a pencil, or use a bone folder to give them just a little bit of a curl. 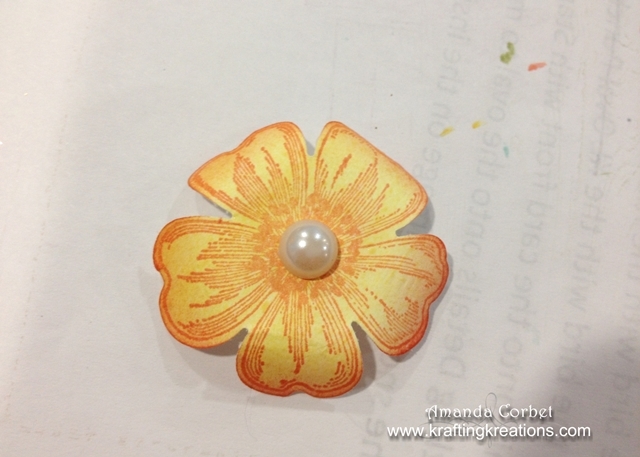 Then add a Large Pearl into the center of the flower for some fun bling! Next take the greeting from Perfect Pennants and stamp it onto a scrap of Whisper White card stock in Baked Brown Sugar ink. Punch out the greeting with the 1-3/4" Circle punch and glue it onto the left side of the card front with a couple Stampin' Dimensionals. 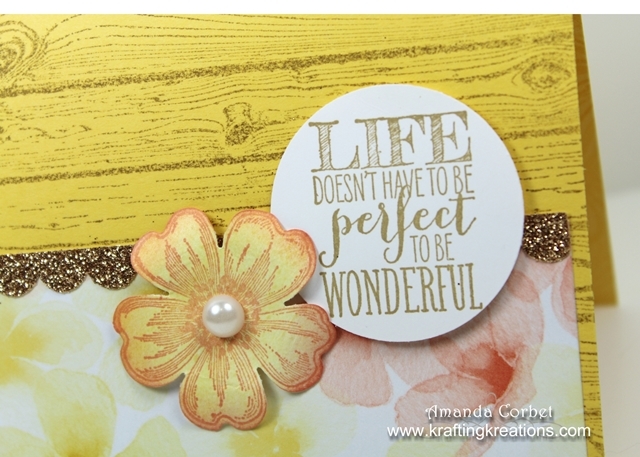 Stick the flower down next to the greeting circle with another Stampin' Dimensional. 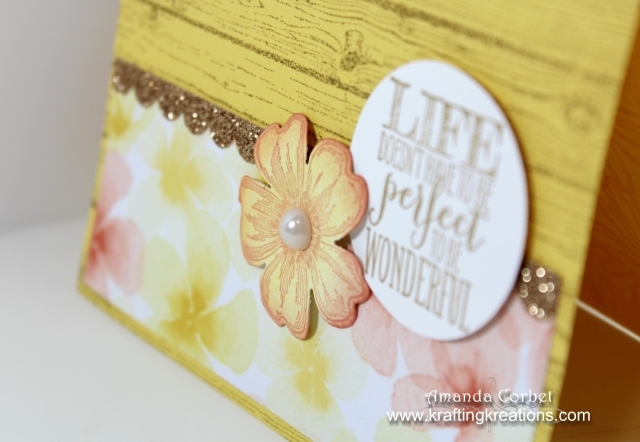 The curled flower and Stampin' Dimensionals really pop things up and give this card some nice dimension. For the inside simply stamp another flower image from Flower Shoppe all over the inside of the card in Daffodil Delight ink. Then take the scrap piece of Champagne Glimmer Paper from when you punched your scallop edge and glue it inside the card at the top. No waste here! That's it! I really do love all the pattern and texture on this card. And I really like the fact that I was able to use that scrap of Glimmer Paper instead of just throwing it away!